ON JUNE 1, 2019 AT NEW LOCATION IN FAIRMOUNT PARK! 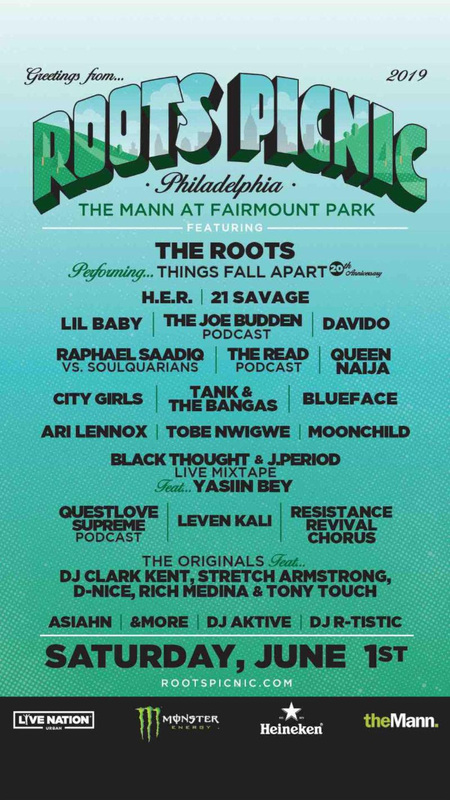 Philadelphia, PA March 12, 2019 – The Roots and Live Nation Urban team up to present the twelfth annual “Roots Picnic” Saturday, June 1, 2019 in Philadelphia, PA. This year the Picnic moves to The Mann Center at Fairmount Park, expanding the footprint overall. Tickets including limited VIP Packages will be available everywhere beginning Friday, March 15th at 12 PM EST. For more details, click HERE. The full confirmed lineup can be found below. Celebrating its twelfth-year anniversary, the festival expands to a larger location in the coveted Fairmount Park area in Philadelphia, using the Mann Center as its hub, the new festival grounds will include 3 stages of music, gaming, art and dialogue. The festival continues to align with music and culture and remains known for careful curation that unites music’s hottest acts, influencers, tastemakers, and thought leaders for one unforgettable day—and this year proudly continues that tradition. Once again, The Roots raise the bar with their flagship festival. The groundbreaking GRAMMY® Award-winning multiplatinum hip-hop collective will headline the proceedings and celebrate the 20th anniversary of their seminal album “Things Fall Apart.” In true Roots Picnic fashion, this year will remain just as unpredictable, undeniable and unique as the Roots themselves. The day includes performances from artists such as H.E.R., 21 Savage, Tank & The Bangas, Lil Baby and many more as well as a bevy of one-of-a-kind moments exclusive to “Roots Picnic” including Black Thought’s “Live Mixtape” featuring Yasiin Bey and a first of its kind Jam Session curated by Raphael Saadiq and Questlove, titled “Soulquarian vs Raphael Saadiq”. As well as a live podcast experience including episodes of The Joe Budden Podcast, The Read Podcast and Questlove Supreme.